Moving house can be expensive but you can make savings along the way. 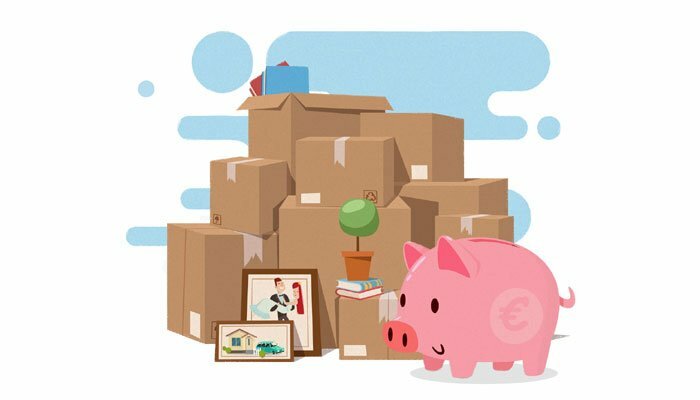 Check out our A-Z for money saving tips that could help you plan, budget and save on the cost of moving house. Moving house is one of the top five most stressful events in life. Buying a house, and indeed moving into your dream home, can also be an expensive time. There can be a lot of outgoings in a short space of time, so it's more important than ever to make savings wherever you can when planning and preparing to move house. If you have any unwanted items such as furniture, unused sports equipment or tools that have been gathering dust, why not advertise them for sale. Websites such as Adverts.ie make the process of selling online hassle free. One man's rubbish is another man's treasure! Rather than spending money on removal boxes, why not go to your local supermarket to get some boxes for free. Supermarkets are usually very accommodating as it saves them having to dispose of the empty boxes. Equally, you are going to put these boxes in the recycling bin after you've unpacked so it makes sense to cut out this unnecessary cost. If using removal services, it's always a good idea to use a comparison website to see which companies offer the best value for money. Shopping around to see where you can get the best deal will really pay off and the time spent researching your options will save you money in the long run. Before you start packing and moving unnecessary items, have a good clean out and get rid of all the stuff you've been hording. Charity shops will be delighted to receive saleable items and clothes recycling banks are a free means of discarding textiles and materials. Make sure to take an electricity reading from your old abode before you leave. Contact your electricity provider immediately and close the account. This way you can ensure you are not paying for any additional electricity usage after you have moved out. Moving into a new home can be expensive especially as there might be household items that you didn't need in your old home but you do in your new place. Look on free ad sites for furniture; even if it's just a stop gap until you have the money to purchase you dream items. At least this way you won't break the bank kitting out your new place. Check if you're eligible for any household grants. If making your home more energy efficient, SEAI offer grants to help with the cost of upgrading homes through its Better Energy Homes Programme. The Home Renovation Incentive (HRI) scheme enables homeowners to claim tax relief on repairs, renovations or improvement work carried out, so it is definitely worth exploring your options here before starting work on your new home. Don't be afraid to ask family or friends for a helping hand. Do you know someone with a van who can help move large items like furniture? Calling in favours will save you a considerable amount of money. Why spend money on professional removal services when your willing friends and family can do just as good a job. You can always reward them with a nice dinner when you're settled into your new place. When moving to a new house there are always endless odd jobs that need to be done. Make a list in order or importance and see which ones you are capable of doing yourself before calling in the experts. Online DIY tutorials can be a great help in getting you up to speed with handy tips to show you how to fix things yourself. Not only will you save money, but you will also be upping your DIY know how! You've found you're dream home and now you want the ultimate kitchen. It is tempting to go straight to the nearest kitchen shop to get kitted out in the latest high spec and expensive kitchen. But you could paint over the old kitchen units in a colour of your choice. A lick of paint will make all the difference and brighten up an outdated but otherwise fully functional kitchen. Having a to-do list is a great way to focus the mind on everything that needs to be done and will make the process of moving a little easier. Having a checklist is also a good way of ensuring that everything is done and in a particular order. This might prevent any surprises; something you forgot or hadn't planned for might cost you money further down the line. Managing your finances particularly in the initial months of a new move can be tricky as there might be more money coming out of your account to cover your mortgage or utility bills than usual. It's a good idea to have some additional finances as a cushion to keep you going until you get into a routine and also in the event an emergency. If you don't ask you won't get! Therefore it makes sense to at least try to negotiate on fees with all providers from, estate agents to the plumber. It's an expensive time moving house, so any savings you can make on this costly transition are crucial. This should be all the motivation you need to be brave and negotiate. Rather than spending additional money on your phone bill, wherever possible change your address details with your banks and utility providers online. Simple and quick to do, not only will it save money on your phone bill but it will also limit your time spent on hold listening to annoying telephone music. Packing yourself is an obvious way to save you money. Rather than spending money on bubblewrap, why not reuse old towels and newspapers to wrap delicate items? This is not only going to benefit your pocket, but it will also mean you can offset your carbon footprint. If there is any work that needs to be done on the new home, get a few quotes so you can see what's affordable and within budget. Prices can vary from vendor to vendor so it makes economic sense to cast the net wide and see what comes back. From the boxes used to carry your possessions to the bubblewrap used to protect your precious items, recycle, recycle, recycle! Not only is it good for the environment but it's a cost alternative to the costly black bin method of disposal. If you have a spare room in the house, you might want to consider renting it out, even if it's only on a short-term basis. The money you earn could go towards home improvements that you can't afford straight away, or it could be used to pay off a lump sum on your mortgage. Rather than employing a cleaner to tidy up either your old or new home, if you can do it yourself you will save a considerable amount. Be practical in your approach and clean your new home before moving all your furniture in. Equally, if you can tidy up your old home once everything is cleared out, that will save you time as well as money too. When you're moving house, it might also be a good time to consider moving utility provider. There are many savings that can be made by switching providers, and shopping around is the name of the game. Many providers will offer additional cost savings to new customers. It might be worthwhile switching even if you are still in a contract but if you have to buy yourself out of an existing contract, it's important to do your sums first to make sure it's not costing you more in the long run. It's a good idea to have a vision for how you would like to decorate your new home and then a budget for how you will cover the costs. If you have a clear idea of the overall finished look, then you can begin collecting household items a little bit at a time, rather than spending a large amount in one go. Moving house on a weekday as opposed to a weekend is advisable as removals will be less expensive during the week. If you are moving on a weekday, avoid rush hour and aim to move late morning or early afternoon when the traffic will be lighter. When moving house, you'll more than likely have all your paperwork filed and packed away so they are easy to find at a later stage. If however you need access to certain documents, it might be handy to make some photocopies which you can use as opposed to the originals. Now that you have moved and know how much your monthly and indeed yearly outgoings will be, make a conscious decision to evaluate your finances each year and see if there are any areas you could budget for or find ways to improve your overall savings. Our budget calculator will help you get to grips with your annual income and expenses and will help you see where savings can be made. Zurich has a number of savings and investment plans specifically tailored to individuals and their requirements. Moving house can be expensive and planning and saving in advance of starting out in a new home is advisable. Small changes in how you budget and spend money can have a positive impact on your overall savings. Our budget spreadsheet will help you plan and manage your money more effectively.